If all goes well in Harare, many Zimbabweans are hoping the next President would bring many young and distinguished citizens on board. One of such is JOSEY MAHACHI... JOSEY MAHACHI is a media practitioner, investment consultant, businesswoman and host/presenter of a television show. She is passionate about the vast African Continent and its diverse cultures and wants to share this richness with the world. Wanting to shape the African narrative, she created Click Africa, a television show that showcases the pride of Africa and broadcasts across the African Continent. Through Click Africa she has hosted African leaders such as President Robert Mugabe, HE Olusegun Obasanjo (Former President of Nigeria), HE Jerry Rawlings (Former President of Ghana) HE Muhammad Buhari (President of Nigeria), high profile business executives as well as ordinary citizens doing extraordinary things. 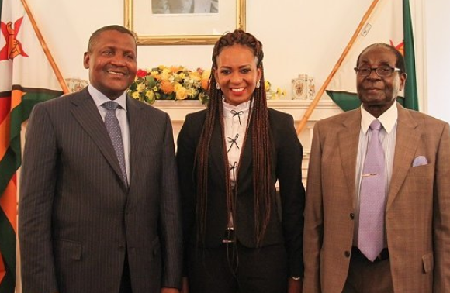 Using her vast network across the continent, Josey has facilitated the travel of Aliko Dangote and Tony Elumelu to Zimbabwe for high level investors meetings. In recognition of her stellar efforts, the Government of Zimbabwe recently appointed her a Non-Executive Board Member of The Zimbabwe Investment Authority and she won the most outstanding person promoting investments award 2015. She has also recently completed by the Mandela Washington Fellowship (YALI)2017 having been selected by The United States Government and the US embassy in Zimbabwe. Josey's greatest ambition is to make a positive impact in Africa and she is now doing it through her Television show that promotes a continent called Africa but she calls it home! !